Sally Sin is an agent for USAWMD. The government bureau with the long, unwieldy moniker is the United States Agency for Weapons of Mass Destruction. It is tasked with searching out people and groups around the world which either have or are trying to get such deadly items and to relieve them of the same. To quote from the first book, it is "comprised of a bunch of analysts sitting around trying to figure out who has what, when they are going to use it, and on whom. Sally Sin is Agent 26. She has no idea why she has that number since she does not think there are that many agents but that was the number they gave her and she had nothing particularly against it. Her real name is not Sally Sin. It was Lucy Parks when she joined the Agency right out of college. Later, when she met and married Will Hamilton, she changed it to Lucy Parks Hamilton, but to her boss and fellow agents, she was Sally Sin. That silly epithet came as a result of a test she took in college, thinking it was for a psychology exam in which she needed a computer name and she thought it a cute one. If she knew that it would stick with her forever, she might have worked on thinking a better one. The results of that exam, which delved into her moral compass and her ability to act quickly and decisively, brought her to the attention of the man who heads the agency, Simon, and eventually to becoming an agent, trained to fight and kill with the best of them. As the series begins, however, she is no longer an agent. After nearly a decade of being one, she decided a normal life was in order and she had met Will and opted to resign. She has since given birth to the real love of her life, Theo, who is three going on 15 and causing her more heart attacks than all the bad guys she ever encountered. She is happily married to Will, though how she could be happy with a green-nic so determined to “save the planet” that he freaks out over anything thrown away that might be recycled, is a mystery. She does not want to ever again put her life on the line for her old boss. She is out of the business. The thus-far two-book series about retired agent Sally Sin who is forced back into the cloak and dagger world is told with tongue firmly in cheek. It is a very light-hearted look at the clandestine world, poking playful fun at all sorts of things in her former and current lives. It is not a satire nor does it ridicule anything. It tells the story of a woman who wanted to change her life but who is forced to return to it on a couple of occasions, trying to juggle responsibilities in both while staying alive and sane. It just tells in a very funny, enjoyable way. Sally Sin was no more. She was a mom with a 3-year old and a husband. Then her old boss visits, letting her know that her former nemesis was back in action and probably out for her neck. The kidnapping of her agency's director forces Sally Sin to come out of retirement again but as she seeks his location, she begins to find out facts on her own childhood, facts that are not so welcomed. 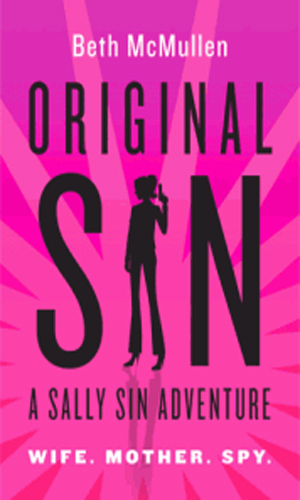 When a series' subtitle is "The Adventures of Sally Sin", the reader gets a pretty good idea that the series is either going to be funny or lascivious. 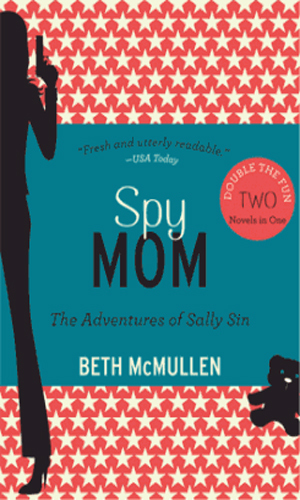 When the official title of the omnibus that came out containing the two novels is "Spy Mom", the reader can certainly hope it is the former. It is. This series is funny. It is often very funny, as in chortling out loud and having to interrupt your spouse to read a passage. Even when it doesn't have the reader vocal, it is funny enough to keep a big smile on the face. Sally Sin's outlook on nearly everything is delightful. She has a spin on things that is constantly a hoot and blessedly accurate at the same time. Unless you are talking about her husband, Will. Him, I'd love to toss into a landfill and watch him go apoplectic, I found him so annoying. But he does not play that big a role so maybe I’ll leave him alone. That and Sally Sin would not take kindly to anyone after her men and even with a silly name like she has, she is not someone you want mad at you. It is very hard to keep humor going for an entire book, let alone a couple. Very few authors have tried it. Ms. McMullen pulls it off. If you need your spies serious and earnest, this series is not for you. If you want a smile on your face, this is it. I read that there might be a third book coming. I hope I read right.